In this current ‘decade of commemorations’, one that has received very little attention, but which had a far wider impact on the general population than most, is the 50th anniverary of the introduction of free secondary education in September 1967. It had been announced a year before by Minister for Education Donagh O’Malley, much to the surprise of his cabinet colleagues, and of the Department of Finance in particular. But once word was out, there was no going back; expectations had been raised and the public response was hugely supportive. Contrary to urban legend, O’Malley’s initiative was not a ‘solo run’, but he did introduce it sooner than originally planned. Up to that point second-level education—apart from vocational schools, which catered for approximately one-third of the student cohort—was entirely private and considered the exclusive domain of the churches, and of the Catholic Church in particular. Indeed, as late as 1966 a nun teaching in a convent school complained to her local bishop about the ‘interference’ of a Department of Education inspector! In this, as in many other areas of social policy, the state delegated responsibility to the churches. (See the review of Fred Powell’s The political economy of the Irish welfare state, p. 67.) Nevertheless, while it was private, it was also state-subsidised, in the form of the partial payment of teachers’ salaries. So it was a twofold discrimination—many low-income taxpayers were subsidising a system from which their children were effectively excluded. Apart from the penny-pinchers in the Department of Finance, there was opposition from some, although not all, of the Catholic hierarchy. To his great credit, that was countered by the great bête noir of contemporary liberal Ireland, Archbishop John Charles McQuaid, who gave the scheme his full support. The effects cannot be underestimated, if only psychologically in the short term. 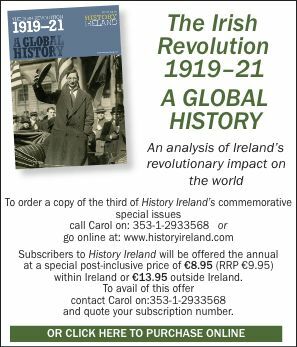 For huge sections of Irish society, and particularly for women, it marked a liberation and an alternative to the emigrant boat or the drudgery of unskilled employment. Within a decade participation rates at second level had doubled. Nevertheless, it took a while for the economic benefits to manifest themselves. During the recession of the 1980s, with the contraction of unskilled employment and the resumption of large-scale emigration (and increasingly of emigrants educated to a higher level at taxpayers’ expense), it might not have seemed such a good idea. But eventually, in the 1990s, the economic, educational and demographic stars came into alignment and the Irish economy took off. To hear more on this topic check out the podcast of the History Ireland Hedge School in the National Library of Ireland on 21 November 2017, at https://www.historyireland.com/podcast/50th-anniversary-of-free-education/.